Daya bai, dressed in a simple cotton saree with colourful necklaces and clinking bangles looked no more than a tribal from India. “And this attire has made me face a lot of discrimination. But I have not given up my desire to serve those exploited in life and live like them.”, she said. 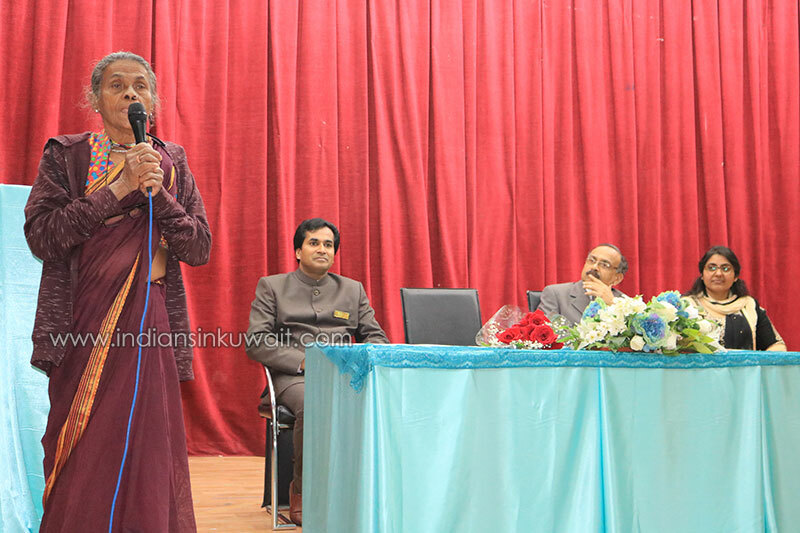 She was interacting with the students at the Indian Community School Kuwait, Senior on February 17, 2019. 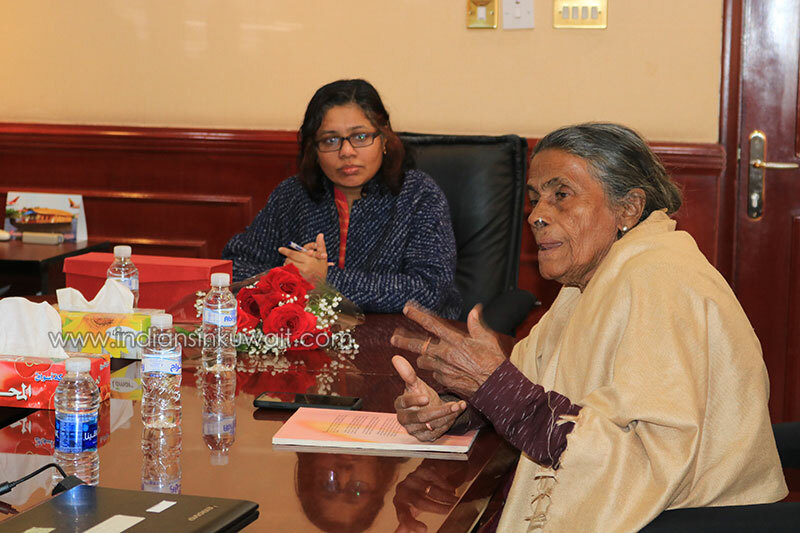 Ms Mercy Mathew, commonly known as Daya Bai is a well-known social activist. From the age of sixteen, she has been working for the uplift of tribal and other oppressed communities in different parts of India. Fighting and striking for the rights of the endosulphan victims in Kasaragod district, Kerala, India. She is also active in their treatment. She was in the war zone Bangladesh serving the war victims. A noted environmentalist, she participated in enormous agitations like Narmada Bachao Andolan. “From a young age I has been keen on understanding why there was inequality in our society? When I had labourers working at my house in Pala, Kerala I wondered why couldn’t they eat with my own family? After graduation, I decided to go and live with the tribal people for some time. That’s where I realised my way of life.”, she answered a student who asked her about the motivation for living her life for tribes. She felt that fighting for equality and to give voice for such people is what she had to do. She advised the students to follow the preamble of the Constitution of India. According to the constitution, every citizen has equal status and rights. “Tribes didn’t trust me and accept me when I started working with them. I felt it difficult and hard to adapt their lifestyle in the beginning. But as time passed by I loved it. After monitoring my actions for a few months, they accepted me”, she said. She explained how she has always been discriminated. She was asked to alight from the compartment of a train or bus before the destination is reached. “But when Daya Bai became famous, people started to greet and even click a selfie”, she said while answering a student who asked her on discrimination. Even after years of such experiences she never felt giving up. Through a real life story, she explained how conflicting experiences in childhood had helped a man work for the needy in life. “She is an epitome of humanity. She is an inspiration to umpteen number of people.”, said Dr V Binumon, the Principal of ISCK senior while welcoming her. Dr Sam T Kuruvilla, the Vice-Principal, ICSK senior honoured her with a memento. Ms Susan Rajesh, the deputy vice principal, ICSK Senior proposed the vote of thanks. The management of ICSK, aiming at the holistic education of the students have always been motivational in a discourse with such inspirational models.